Michael Pollan is an author, food activist, journalist and professor of journalism at the UC Berkeley Graduate School of Journalism. He mainly focuses on the industrial food chain with regards to his research. He emphasizes how cooking is one of the simplest and most important steps people can take to improve their family's health, build communities, help fix our broken food system and perhaps most importantly, break our growing dependence on corporations. 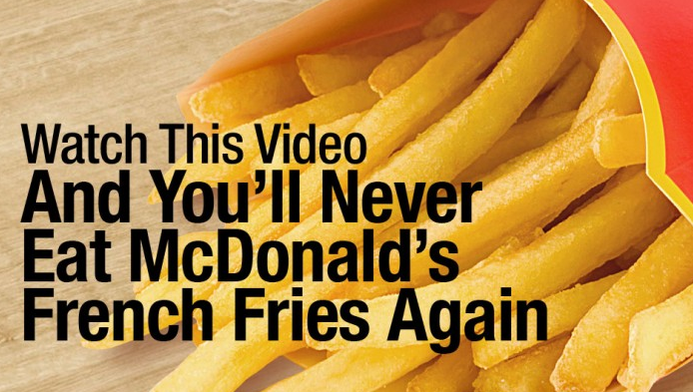 In the video below he illustrates how McDonald's insists on using Russet Burbank Potatoes, a potato in America that is unusually long and difficult to grow. They further insist that their potatoes have no blemishes at all, which is hard because these potatoes commonly suffer from what is referred to as Net Necrosis, which causes unwanted spots and lines on the potatoes. I'll let you watch the video for more information, you should have a hard time eating McDonald's after this, but that's not a bad thing. Cancer rates continue to rise,and study after study continues to surface every year showing how pesticides, GMOs and a number of other things we choose to surround ourselves with on a daily basis are indeed harmful to human health. It's time for us to wake up and fully acknowledge it, it's time to make better choices in our lives, it's time to put two and two together and make connections. Fast foods chains are no different from drugs. They are extremely addicting and extremely harmful. They should not exist and this video just adds to the long, continually growing list of why.